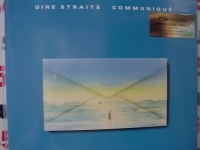 "Dire Straits, Communique (limited stock) - 180 Gram - Silver Sticker #11"
Simply Vinyl 180 Gram Limited Edition Analog Virgin Vinyl. "Communique" sold a staggering 7million copies without even generating a huge hit (although "Lady Writer" did register slightly in the lower reaches of the US Top 50). In fact, "Communique" must have been a great experience because the producers invited the whole band over to Muscle Shoals Studios to help out with Bob Dylan's "Slow Train Coming later in the year! Definitely one for the Dire `die-hards'! Tracks Include: "Once upon a Time in the West" "News" "Where Do You Think You're Going?" "Communique" "Lady Writer" "Angel of Mercy" "Portobello Belle" "Single-Handed Sailor" "Follow Me Home"